We've been Insta-stalking Hollywood celebs hitting the Manila scene lately. First up: Vin Diesel! 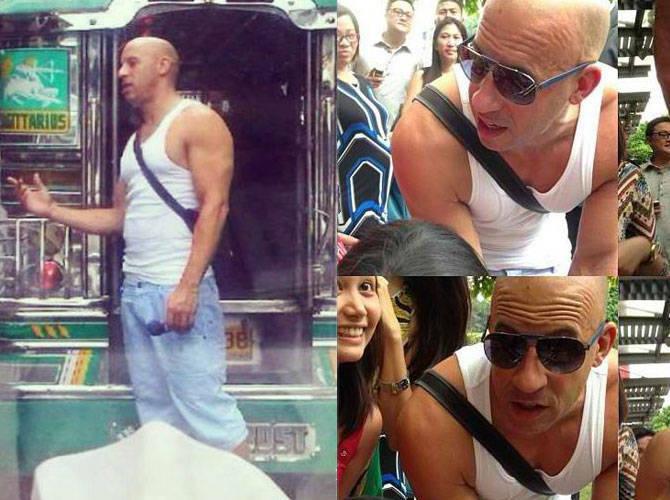 Social media sites buzzed non-stop when photos of a wifebeater-clad Vin Diesel walking around Bonifacio High Street on Tuesday, May 14 surfaced. This photo from the Bonifacio High Street instagram showed that the Fast and Furious 6 star was caught taking photos with fans on a hot summer afternoon. We also found a video going viral on Facebook of the hunk kidding around with Pinoy kids. Isn’t that sweet? A few hours after, new photos of the hunk showed him getting the full Manila experience by riding a jeepney in the Makati Area. Vin’s co-stars Michelle Rodriguez, Gina Carano, and Luke Evans are set to join him for the red carpet premier of Fast and Furious 6 in SM Mall of Asia tonight, May 15. Accompanying the actors are producer Neal Moritz and director Justin Lin. Unfortunately, hunks Paul Walker and Dwayne “The Rock” Johnson won’t be joining the cast in the Manila premier. Sorry ladies! We’re crying too!